Yes. In certain situations, you still will be able to sue property owners even if they did not have notice of the unsafe condition which led to the accident. The test is an issue of reasonableness applied to the particular facts and circumstances of the underlying incident. How Can I Sue A Property Owner For An Illinois Slip And Fall Case? What Do Illinois Slip And Fall Cases Come Down To? What Is The Difference Between Invitees, Licensees, And Trespassers? What Is Illinois Law Regarding Invitees, Trespassors, And Licensees? How Does A Lack Of Notice Impact My Illinois Slip And Fall Case? Contact Us Today And See If You Have An Illinois Slip And Fall Case! Regardless of where you slipped and fell, if you decide to sue the property owner, your cause of action will most likely be for negligence. It won't be any different if you fall on a residential property or commercial property. Negligence actions state that the wrongdoer failed to act reasonably in the situation. Plaintiffs must prove how the defendant breached a duty and how that breach caused the his or her damages. The crux of Illinois slip and fall cases will come down to duty because it will change depending upon the plaintiff and the setting. It will depend upon the plaintiff because owners owe different people different duties. They generally owe very little to trespassers but a lot more-including reasonable care- to invitees and licensees. In fact, Illinois law doesn't recognize the difference between invitees and licensees. It will also depend upon the setting because commercial and residential property owners have different expectations for their premises and that contours their duties to the people that enter them. So this is how you will sue property owners for Illinois slip and fall cases but now we will turn to how a lack of notice might influence that case. INVITEES: Invitees are either explicitly or implicitly asked by the private property owner to enter the land. Thus, they are owed all due and ordinary care for the circumstances. This class of persons may include friends and even contract workers. LICENSEES: Licensees are people who are allowed to remain on the property either explicitly or implicitly. Many times, guests or companies are considered licensees on private property but so are any of those parties that could reasonably be within this class in the future.. Private property owners owe licensees the duty to protect them from wanton injuries. TRESPASSERS: Trespassers enter private property for their reasons and without any sort of permission. Still, they are owed a duty by the property owner. Specifically, owners must avoid specifically attempting to harm trespassers. Furthermore, once the presence of trespassers has been identified or could reasonably be anticipated owners must use ordinary care to avoid harming them. These definitions have normally defined how private property owners must treat all the various kinds of people that enter their land. "The distinction under the common law between invitees and licensees as to the duty owed by an owner or occupier of any premises to such entrants is abolished…The duty owed to such entrants is that of reasonable care under the circumstances regarding the state of the premises or acts done or omitted on them." As you can see, Illinois property owners must exercise reasonable care towards invitees and licensees. Therefore, you still may be able to sue the property owner even if they didn't have notice of the unsafe condition, and you are an invitee or licensee, if the owner was not using reasonable care toward you. Reasonable care typically compels owners to correct open and obvious dangers as well as discover and fix concealed dangers that invitees or licensees might be exposed to. Reasonable care is to be judged using all of the facts and circumstances. As we discussed above, no matter how or where you slipped and fell, your lawsuit will likely be for negligence. How does a lack of notice impact that case? Well, it will shape how reasonable the defendant acted in the situation. For instance, if the defendant breached a Chicago Building Code violation and that affected your injury, then it doesn't matter that the owner didn't have notice because it will still be deemed negligent. On the other hand, if the defendant was a residential homeowner, and the source of the slip was recently fallen snow, then that might mean that the defendant acted reasonably because owners don't have a duty to remove snow or ice. Finally, if the owner was a store or business, and one of its employees had notice of the unsafe condition, then it wouldn't matter that the company itself lacked knowledge because the employee's knowledge would be imputed to the employer. 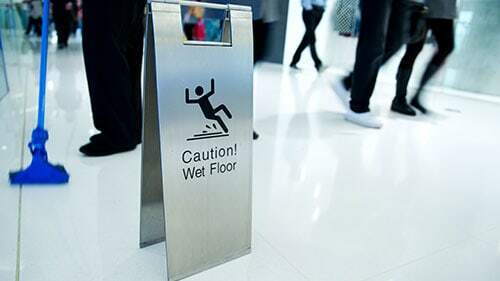 Therefore, the effect of a lack of notice depends on the circumstances of the slip and fall accident as well as the nature of the duty owed by the defendant. As you can see, Illinois slip and fall cases present thorny issues. They play objective factors off subjective factors. To say the least, they require skilled legal representation. This is especially the case when the culprit is a company of at least modest size. Most businesses will argue that they had no reason to protect against the condition which caused your injury. This is exactly when you need a lawyer to stand up and reject these contentions. Rosenfeld Injury Lawyers LLC has a history of representing plaintiffs in premises liability lawsuits. We know the standard lines that property owners give injured invitees and we can help you rebuff them. Also, we offer free consultations to all of our clients to initiate the process of obtaining relief. To begin your road to recovery, just give us a call at (888) 424-5757 or use our website contact form to reach us.